Colonel Reuben Wells Leonard (1860-1930) was a teacher, civil engineer, militia officer, inventor, businessman, senior civil servant, and philanthropist. In December 1923, he signed the third and final version of the Leonard Foundation trust deed, donating over $500,000 to create a fund for scholarships tenable across Canada. The deed begins with a statement of Leonard's belief that the "White Race is, as a whole, best qualified by nature to be entrusted with the development of civilization and the general progress of the world along the best lines". It goes on to recite that the progress of the world depends on the maintenance of the Christian religion and the independence, stability, and prosperity of the British Empire. The student awards created under the trust were therefore available only to persons who were White Protestants of British nationality or parentage. The Leonard Foundation operated under these terms for over 60 years. When the legality of the trust was questioned in the mid-1980s, an Ontario court ruled that it was valid, and it was not until 1990 that the Ontario Court of Appeal reversed the initial decision and held that the discriminatory qualifications were unlawful. Leonard's life provides the backdrop for the central subject of Unforeseen Legacies: an exploration of Canadian values and beliefs as filtered through the ideologies of Colonel Leonard, the Leonard Trust, and the law governing private discriminatory action. In part, this study investigates Canada's response to issues of race, discrimination, and tolerance of and respect for difference, then and now. 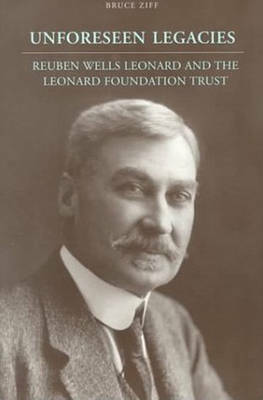 This book is about Reuben Wells Leonard, the Leonard Foundation trust, the litigation concerning the validity of the trust's discriminatory provisions, and the judgments rendered in the Leonard Foundation case. Part biography, part intellectual history, part legal history, it concludes with a discussion of contemporary law and policy.